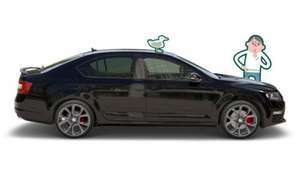 Skoda Octavia vRS with Black Pack ans 19" Xtreme Alloys £229 per month on 0% APR with £4000.90 deposit and final payment of £10,507.50 over 42 months. (Total £23897.40) Rainworth Skoda. I think this is a great deal for someone who is looking for a new car and has a car that they could potentially part exchange. Most people I imagine, especially heavy users will hand back at the end of 42 months and there appears to be no mileage restrictions. Whether you prefer the power of petrol, or economy of the diesel – the SKODA Octavia vRS is built around some impressive figures. The flagship Octavia has been in production for around 15 years now. Unlike other models in the hot hatch sector, the Octavia has made the transition to the affordable performance car class with very little sacrifice. The diesel Octavia vRS offers a combined cycle of 64.2mpg, making this performance derived hatch exceptionally affordable on a day to day basis. If you’re more bothered about MPH as opposed to MPG, the vRS 2.0 TFSI will crack 60mph in under 7 seconds. Both cars are available as either a hatchback or an estate model. We’ve decided to put together a special offer encompassing the incredible benefits of the most popular Octavia vRS, the 2.0 TDI CR Hatchback, along with a some added extras – making this car look and feel even better than the award winning base model vRS. For this offer we’ve included the “Black design package plus” option which is worth £750.00. This includes the very special (and incredibly rare) 19inch ‘Xtreme’ alloy wheels, sunset glass, Colour Maxi DOT trip computer alongside everything that is included with the regular “Black design package” – black radiator surrounds and black wing mirrors. We think there is only really one colour for the car, which is of course – Black Magic Pearl. Normally this too is an optional extra, worth £360.00 (For the more adventurous, other Metallic and pearl effect colours are available!). In base form, the vRS still comes with Bi-Xenon headlights with AFS and LED daytime running lights, LED rear lights, Sports suspension, a 3 spoke Multi-function steering wheel, Cruise control, Lane assist, Light assistant and a rain sensor. Add all that to our choice additions, makes an incredibly high specification car. The whole package is worth £25,185. We’ve discounted the car as much as we possibly can and we’re also throwing in 0% APR finance, meaning you could be driving this incredible package for as little as £229 a month. Yet another impressive number. It’s a saving of nearly £1,300! (there’s another one). This isn’t a deal you will find at other retailers, this offer is specific to Rainworth ŠKODA. We’re passionate about cars and we’re passionate about great value. Even the figures look great, see below for details on how the offer is made up. This offer isn't one you will find elsewhere! A bit like those toilet roll offers. Surely it's better just to lease it with a relatively low up front payment. There has to be a mileage restriction on this deal as the GMFV would seriously change if it had 150k miles on it. There has to be a mileage restriction on this deal as the GMFV would … There has to be a mileage restriction on this deal as the GMFV would seriously change if it had 150k miles on it. Indeed - i have emailed them as if they will accept 30k per yr i am all over it. At one time i was doing 40k a year... don't think you would be opting for the final payment with those miles! Surely it's better just to lease it with a relatively low up front … Surely it's better just to lease it with a relatively low up front payment. £20K including options from a broker. You sure are paying a lot extra to have it 'interest free'. Indeed - i have emailed them as if they will accept 30k per yr i am all … Indeed - i have emailed them as if they will accept 30k per yr i am all over it. At one time i was doing 40k a year... don't think you would be opting for the final payment with those miles! I'm all for a great lease deal, but 4k down?! Cold. OK, how about this - 4K down on a Skoda. Still cold.